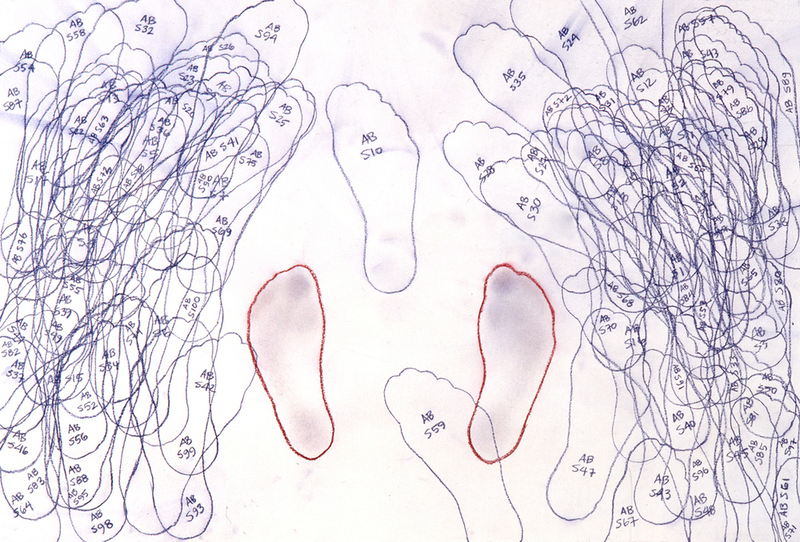 In Mark (2002), Type A used their studio floor as a surface on which to delineate territory and compare bodily dimensions. With Push, they again turn drawing into a territorial act, documenting the results in drawings, photographs and video. For the drawings, Type A takes turns standing and shoving each other on large pieces of paper. The pusher’s step, the pushee’s landing or some combination thereof is outlined and systematically numbered in sequence. The result is part dance chart, part Twister, part motion study. The paper becomes a wrestling ring or battleground; the evidence of each push documented with footprints and smudges. 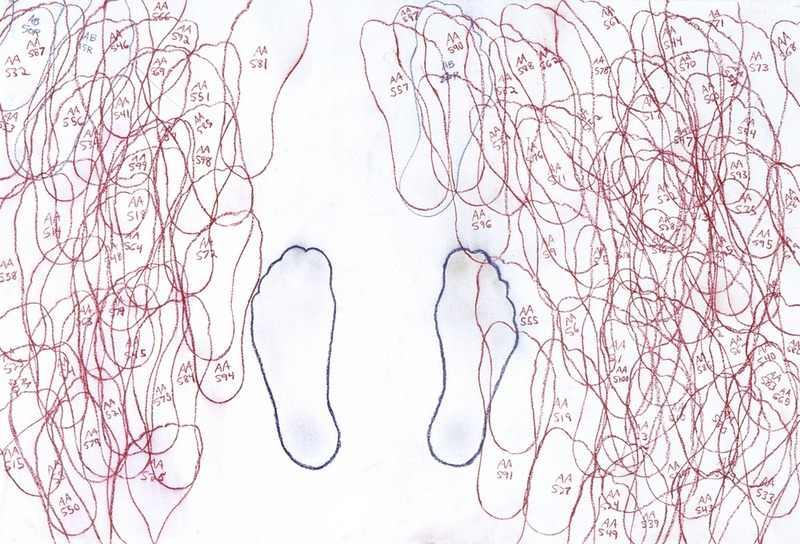 The drawings exist as detailed evidence, a brief history of itself that can be used to reconstruct the entire process after the fact by carefully examining and sequencing each footprint. Each drawing is made both by choice and by chance. Pushes are made with intention, whether to accentuate an emerging structure in the drawing, create a specific effect, or avoid certain resolved areas. The element of chance is always present, and the drawing emerges as much by chaos as by order. Composure and control is lost, then regained, and the resolution recorded. For the photographs, Type A utilizes a basic black backdrop and short interval strobes to isolate spilt second details of one member’s journey through the frame, the result of an aggressive push. In freezing the action, Type A accentuates the body’s loss of control against the forceful shove and the ensuing comical yet oddly graceful movements. The photographs are paired in diptychs showing Ames and Bordwin heading towards each other. In Push (Overhead), Type A uses video to further interpret the push as a dance. Using the same short interval strobe combined with an overhead point of view, the result of a series of pushes is videotaped, separated into short clips and reassembled in alternating order. Accompanied by manipulated audio of a flash pop, the staggered pieces form a dance, the space becoming part studio, part disco, part surveillance area. Each flash catches a body unawares, moving within a larger space inferred by the prevailing darkness.